After releasing multiple betas Apple has finally released the new iOS 8.3 update for all models of iPhone, iPad and iPod touch and it is now available for download. The update brings several new features and improvements to the operating system while fixing many bugs. 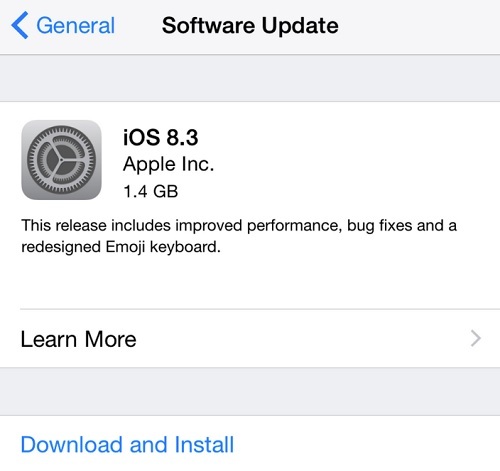 iOS 8.3 introduces new emojis to iOS and adds a redesigned emoji picker that classifies them in a better way. Apart from that it brings wireless CarPlay feature, new key for iPhone 6 Plus’s landscape mode for bold/italic modes, support for new languages in Siri and more. Other minor changes include ability for Siri to make calls directly over speakerphone, two-factor authentication for Google accounts, changes for Passbook and Photos apps, thread filtering for Messages app etc. If interested, you can download iOS 8.3 over-the-air through the Settings app (Settings > General > Software Update) or using the direct IPSW download links below. The build number for this release is 12F69 | 12F70. If you have a jailbroken device and wish to maintain its status then it is recommended that you stay away from this update until a tool is released.